Dalat is one of the most popular vacation cities among Vietnamese people and well known to tourists for all of the incredible waterfalls in Dalat. Many people visit Dalat every year for an adventure activity known as Canyoning, essentially climbing down waterfalls. 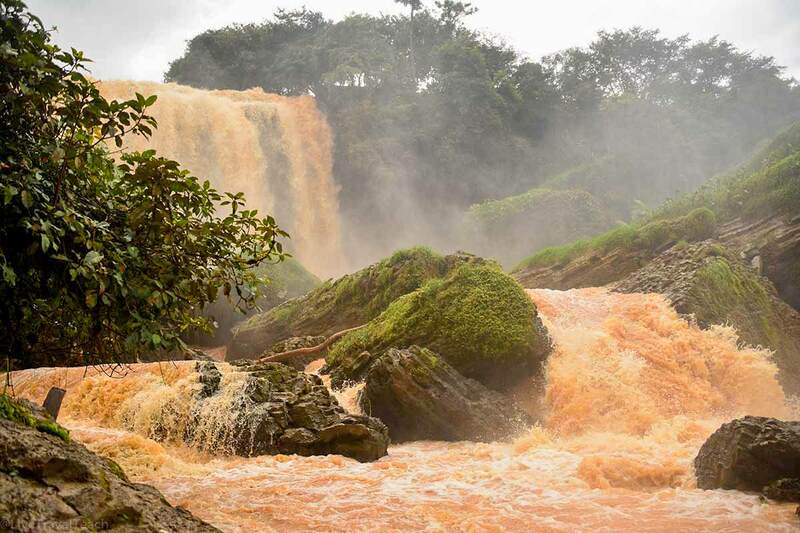 Even if you aren’t here to climb down the falls you’ll still find lots of amazing scenery and in fact, the most beautiful waterfalls in Vietnam are found here in Dalat. I spent 2 months driving a motorcycle across Vietnam and hope you enjoy my 3 favorite waterfalls in Dalat and it helps you plan your trip. Scroll down to the bottom for some hotel recommendations in Dalat too. 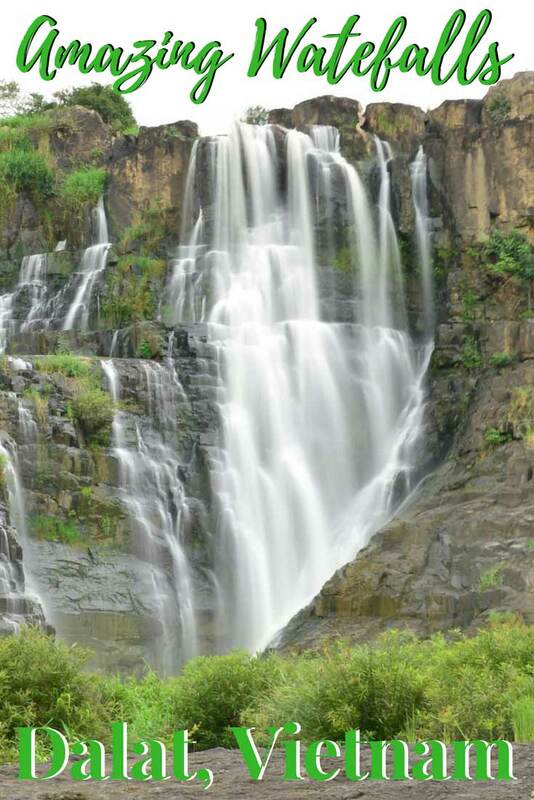 Must see Waterfalls in Dalat Vietnam! 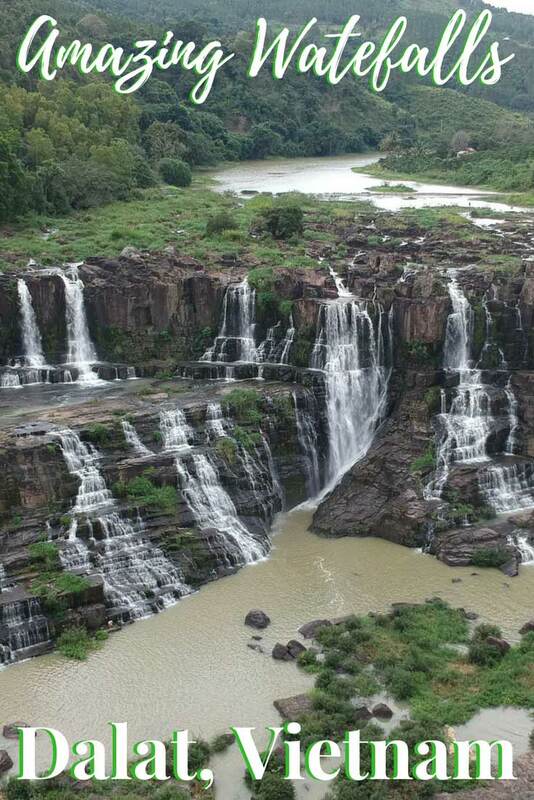 Thác Pongour, aka Pongour Waterfall, is a must-see waterfall in Dalat! This massive cascading series of falls creates a wall of water longer than a football field and infinitely more impressive. Any single slice of this beautiful cascade could be the nicest waterfall in a country but together I have to say this just might be the most amazing waterfall I’ve seen in the world! Perhaps I felt so awestruck by this waterfall because it was the first one I had a chance to fly a drone over and this new perspective makes it even more amazing. 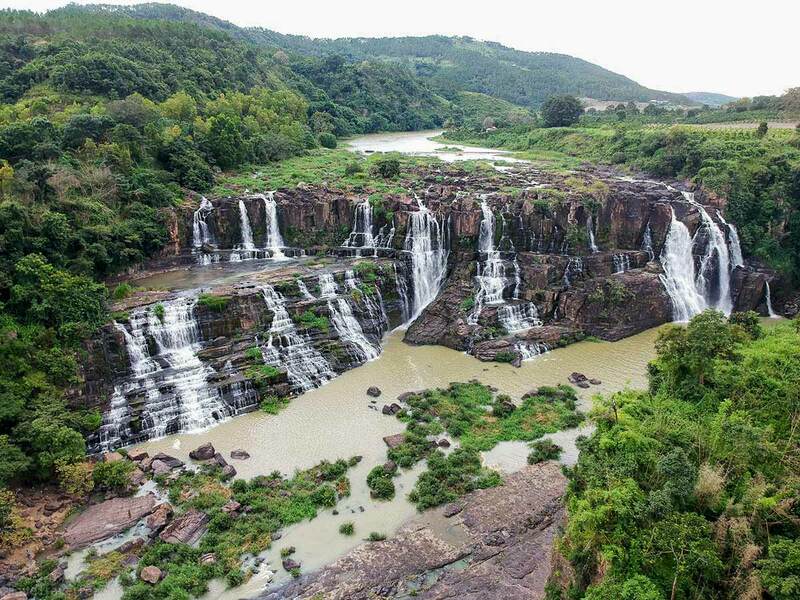 But then again, Pongour waterfalls regularly tops the list of most amazing waterfalls in Vietnam and should be the #1 thing to see in Dalat. 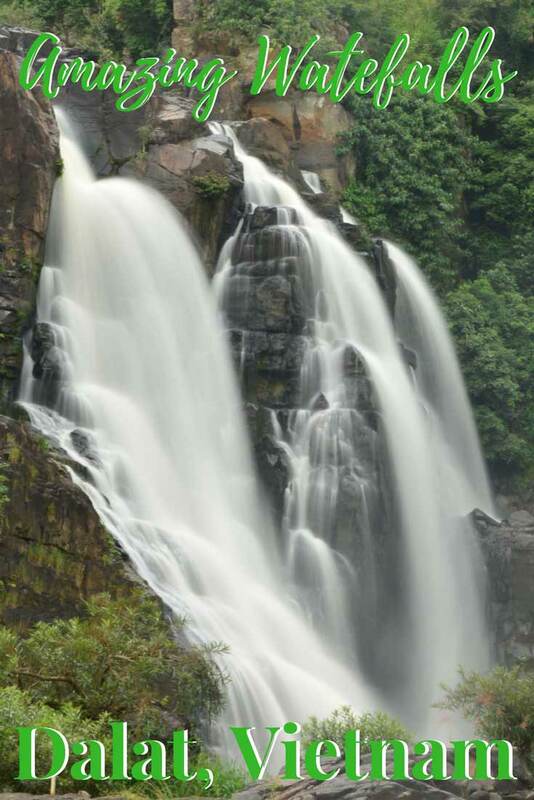 Elephant Falls, locally known as Thác Voi, is much closer to Dalat than Pongour falls and a very scenic drive. You can easily visit both in one day if you’ve got your own transportation. But I’ll tell you more about getting around later, for now, let’s just bask in the beauty of Elephant Falls! You’ll find the falls near a small parking lot and can instantly hear the roar of the deluge. Walking towards it you’ll see a cloud of mist rising and some stairs just past the shops on your right. Heading down these rickety stairs you’re sure to feel the damp air and get wet but be careful because the path will likely be slippery too! I was there in the rainy season and part of the path had turned into a raging river so I had to limit my exploring to nearby lookouts. If you go to Elephant Falls and have a chance to explore the lower sections let me know! I had to settle for putting the drone up and seeing Elephant falls from the air. Many people come to Dalat for one purpose, canyoning, or climbing down a waterfall, and Datanla Falls is the best place for it! You’ll have to reserve a tour ahead of time but as of Summer 2017 should cost you about $40 per person. If that is too steep for your budget then you might not want to even bother visiting Dalat. Actually, scratch that and shell out the money for canyoning because it is a totally unique adventure that everyone should try! Canyoning in Datalna falls is like having your very own natural, outdoor waterpark! Thinking about going Canyoning in Dalat? There are some inherent risks with that adventure and I highly recommend getting travel insurance before you go. I used World Nomads and even though I didn’t need it the peace of mind it gave me helped me enjoy the trip so much more. They are quite affordable and will give you an instant quote if you fill in the info below. Your guides will teach you the basics of rappeling, provide all your gear and let you practice on dry land before you try the real thing. We spent a half day going from one fall to the next with a few lazy river sections in between. If you’re up for it they’ll show you where you can cliff jump and even let you ride down one of the waterfalls like a waterslide! Canyoning in Datalna falls is like having your very own natural, outdoor waterpark! 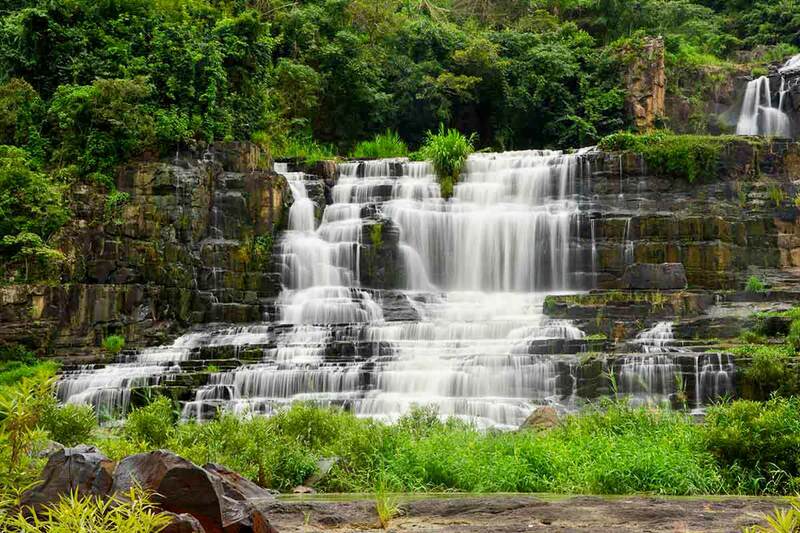 Which do you think is the best waterfall in Dalat? Comment below to let me know. For another amazing waterfall in Vietnam check out Ban Gioc Falls on the northern border with China. It’s Asia’s largest multinational waterfall. iColor Dalat Hostel – I didn’t stay in a hostel in Dalat but heard plenty of chatter about iColor Dalat Hostel. it’s hard to beat their $4/night rooms and everyone says they have the best staff and chilll pad. Better reserve a bed today. Dalat Colico Hotel – We loved this cute hotel for only $7/night. Run by a cute old lady who simply LOVES Dalat and her tiny pug, named Vodka. She helped us arrange our Canyoning trip and runs a hotel that is great for a couple that would rather spend their money on adventure than accommodation. Gia Pham Hotel – These are the highest rated rooms (on Booking) in Dalat for under $10. Check them out and let me know what you think. Flowers and Rocks Villa – A beautiful villa with lots of options between $20-$60 per night. The Flowers and Rocks Villa has a wonderful decor and would be my hotel of choice if I were bringing my family or a group to Dalat, Vietnam. Villa 288 – Stay at a beautiful villa for only $74/night! You’ll have a sundeck with a mountain view and a homey feel. Great for a family or if you’re staying a bit longer in Dalat. Looking for other things to do in Vietnam? If you enjoyed this post please share it by clicking the buttons on the left. Don’t forget to pin your favorite image below on Pinterest too! Hi Mike, Looks like you had a great time checking out Vietnam! This is one of our most favourite countries in Asia!! So beautiful and great food! I’m sure you loved the riding around the country and checking the amazing waterfalls. If I had to pick my favourite, it would be the Elephant one for sure!! Safe travels!! I’ve heard lots of good things about Dalat but I didn’t know it had so many beautiful waterfalls! Elephant Falls is my favorite one, especially from your shots from the rainy season. It might be a little scary during that time but it looks incredible. Hello, fellow teacher! This article is reminding me of the fun times I spent in Da Lat, but I’m realizing… I missed all the good waterfalls! I’m particularly intrigued by Ban Gioc Falls, even though it’s all the way on the northern border with China. Clearly I need to come back to Vietnam soon! Hello fellow teacher 🙂 Thank you for stopping by. I hope you get back to Vietnam soon. This was on my 2nd trip, I feel like its just one of those countries that you can keep returning to and always find something new. Love the inclusion of gifs in your post! Ever since I saw that picture of monks in Pongour waterfalls, I always wanted to go there. Now you just make me want to speed up my travel planning for Vietnam! Thank you Darlene. It was the first time I’ve tried using my drone/GoPro to make a gif. I know exactly what monk picture you’re thinking of! You should definitely move Vietnam to the top of your list. All the waterfalls look great and I bet people love the experience of canyoning down a waterfall too. My fave would be the first one. The multiple streams make it look so pretty. My favorite was the first one too! Pongour is like nothing else I’ve seen before. Definitely the best waterfall in Dalat. Gorgeous waterfalls! I’m really taken with the pics of Elephant Falls and the red water. I hope to visit this area sometime.. Thanks for the helpful travel tips, too. The red water actually comes from the monsoon rains washing so much red clay and dirt into the river. I was wondering about the red water! Just saw the reason in the comments above. The photos are gorgeous. I’ve been to Vietnam some years back but not to Dalat, clearly I need to return as I’m a sucker for an amazing waterfall spot. Each one of the water falls is better than others. I, however, find Elephant falls to be the roughest. It could be because of the angle of the video. I am adding this to my list of things to do in Vietnam. The prices are as good as free! Every single one of the falls are beautiful. I love the angle and orange murkiness of the Elephant Falls! I enjoyed the way you presented them as well! The waterfalls in Dalat look really impressive, Mike. I didn’t realise they had such a high volume of water.. The orange water of Elephant Falls in particular makes it pretty interesting. Such a gorgeous series of falls on display! I love the idea of canyoning along the falls. It looks epic! And $40 is not too steep a price for an experience like that either. Fantastic! One of my favorite things about traveling in Southeast Asia was swimming in beautiful crystal clear waterfalls on a hot day. These waterfalls look absolutely spectacular! I would really like to do the canyoning experience at Datanla Falls – to looks like a lot of fun and a great value for the price. The Pongour Falls look spectacular, like something from Lord of the Rings. I think we would definitely give canyoning a go. This definitely makes me want to visit Dalat. I love waterfalls. I’d particularly want to visit Datanla Falls. Aww Dalat! I love it here so much – this was a big highlight of my Vietnam trip. Elephant Falls looks epic! \You will love it when you go to Dalat, Where do you live in Vietnam? These falls are all amazing but the series of falls in Pongour stood out for me! I also love your shot of the orange water, it’s hard to believe the color comes from clay and dirt! How much does it cost to rent a motorbike? Pongour was without a doubt the best one of these 3 waterfalls near Dalat. I heard that the orange water was because it was near monsoon season but sometimes Elephant falls is a different color. We bought our motorbike for about $300 USD but I think you could rent one for $4-15 USD per day. The best thing would be to ask at your hotel or a tour company in Dalat.